High Tide Foundation is an amazing charity which has already come so far as we enter the 67h year of being there for the young people of Teesside and our amazing members. We gain greatly from our education members and business members, but we also wouldn’t have come this far had it not been for the fundraising involved. 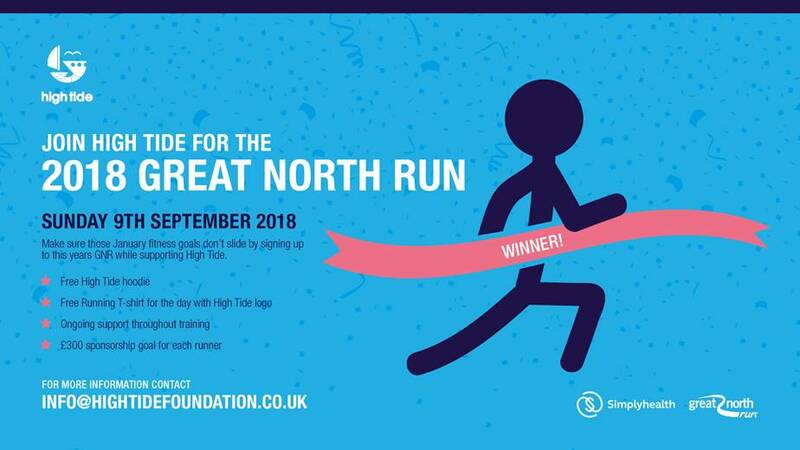 We would love for you to get on board this year as we take on The Great North Run 2019, raising money for the ongoing future of The High Tide Foundation and the programmes that we are able to offer to the young people of Teesside and surrounding areas. We have places available and these will be on a first come basis. The discounted charity run registration fee of £50 will also be payable at your earliest convenience to secure your place. Each runner will have the aim to raise £300+ for The Foundation and in return receive a discounted registration fee, a running t-shirt for the day, an official High Tide hoodie and continued support throughout training. The Simplyhealth Great North Run is the biggest half marathon in the UK and the World with over 57,000 runners taking part in the famous 13.1 mile UK half marathon and it takes place on Sunday 8 September 2019. Broadcast live on the BBC, the Simplyhealth Great North Run, on Sunday 8 September, sees thousands of runners take on the half marathon challenge every year. Starting in Newcastle upon Tyne the 13.1 mile course is lined with supporters all the way from the iconic Tyne Bridge, right out towards the stunning coastline in South Shields. Since 1981 the world’s greatest half marathon has welcomed over one million people across the finish line in South Shields and we’re looking forward to cheering on the next million. You can visit the official website for more information at www.greatrun.org/great-north-run. High Tide will be taking some charity places within the race so if you’re interested in taking part and raising money for High Tide please get in touch. If you’d like to take part or find out more information about this event then please get in touch with the High Tide team on 01642 233 597 or drop us an email at info@hightidefoundation.co.uk.